Ultimus WebClient is an end user environment designed and developed to allow users to easily interact with their process tasks. Involving no complex configurations, Ultimus WebClient uses the latest web technologies so process participants can interact with business tasks from any HTML5 browser, with a customizable and superior user experience. 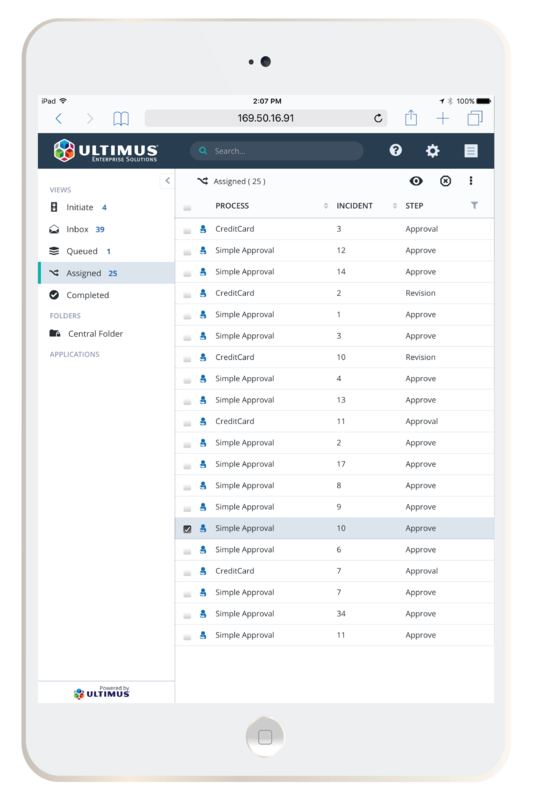 Ultimus Advanced Task Service (UATS), a new module outside the traditional Ultimus Adaptive BPM Suite, is a service layer between one or more Ultimus BPM Servers and Ultimus WebClient, that efficiently transfers the retrieved business process data to client devices. The Ultimus Advanced Task Service streams data from Ultimus BPM servers and transfers it efficiently to client devices. End users experience short response times while performing operations. Ultimus WebClient is designed to run on modern web browsers and Internet-connected devices. It is also compatible with mobile devices, such as tablet PC’s or the Apple iPad. Ultimus WebClient does not require any installation on local client devices and runs without any prerequisites. This eases deployment on end user client devices and provides maximum flexibility when designing solutions. Access rights are granted based on role membership and can be centrally administered. This state-of-the-art approach simplifies user management and enables a tight security concept. Ultimus WebClient has a modern design and contemporary user experience, such as dragging-and dropping process incidents, over-scroll bounce, easy customization, and fast localization. Ultimus Advanced Task Service architecture allows for use cases that reduce cost, increase security, and optimize IT infrastructure.